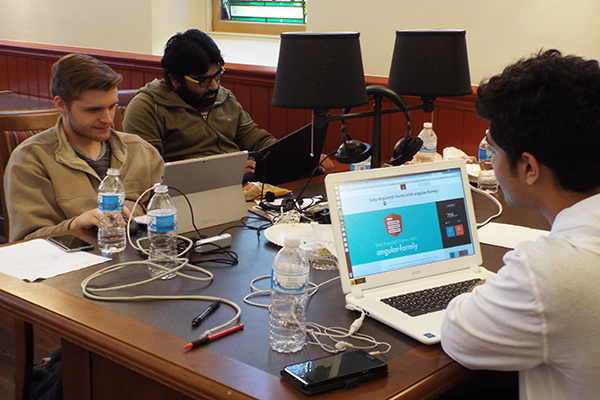 More than 50 students participate in DelHack, a hackathon hosted by the University of Delaware. DelHack winners Jeremy Keeler and Kyle Sullivan developed a Restaurant Heat Map. 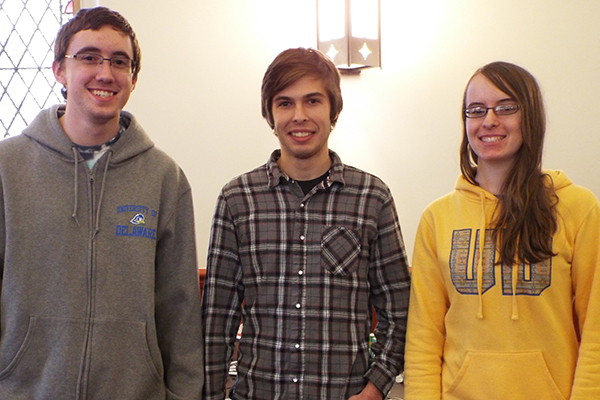 The DigiClick team of Jeffrey Volz, Alex Haldeman and Valerie Carter took second place. The Classrm.tv. team took third place. Pictured are Riley Shaw, Karan Kotwal and Jay Thakkar. Not available for the photo were team members Mark Barbera and Jacob Aimino. 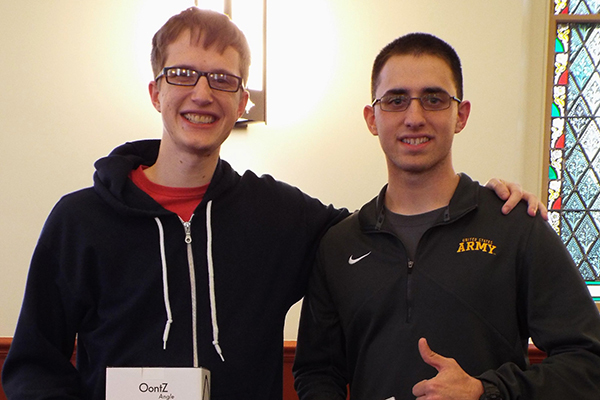 8:59 a.m., Dec. 15, 2015--A web app that tracks restaurant traffic and offers flash deals, a glove that allows users to control their computer cursors, and a digital classroom that lets educators crowdsource knowledge through open classrooms were the top winners at a recent University of Delaware hackathon. Held in Daugherty Hall last month, DelHack was run by the Association for Computing Machinery (ACM) and sponsored by the Horn Program in Entrepreneurship and the Office of Economic Innovation and Partnerships, as well as SevOne, a local tech company. More than 50 students from a variety of UD majors participated in the 24-hour event. 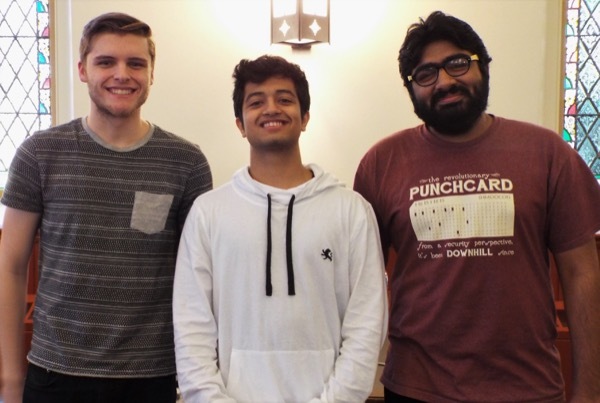 “From freshmen to graduate students, participants pitched ideas, learned new technologies, and socialized during much-needed breaks,” says Chris Bubel, a junior computer science major who serves as president of the ACM student group on campus. Terry Harvey, associate professor in the Department of Computer and Information Sciences, sees hackathons as a great way for students to practice valuable prototyping skills. Judges included ConnectHub founder John Royer, itr8group cofounders Rory Laitila and Adam Steele, Archer Group business analyst Jessica Scarane, and Digital-Vikings cofounder Kjell Hegstad. Restaurant Heat Map (Jeremy Keeler and Kyle Sullivan). This web app tracks how busy restaurants are in a given area. Users can navigate a map to see what restaurants are busy and also pick up flash deals. Restaurant owners can view data about how busy their restaurant is and toss out flash deals to attract customers. DigiClick (Jeffrey Volz, Alex Haldeman, and Valerie Carter). This glove allows the user to control the cursor on his or her computer. The intuitive controls make navigating easy and enable the user to navigate without the restrictions of mice or trackpads. To move the cursor, the user simply rotates his or her hand in the desired direction. To click, the user depresses and retracts the index finger much like clicking an invisible mouse. Classrm.tv. (Karan Kotwal, Riley Shaw, Mark Barbera, Jacob Aimino, and Jay Thakkar). This team harnessed the YouTube API (application program interface) to create a digital classroom that lets educators crowdsource knowledge through open classrooms. “The ACM board is incredibly grateful for his passion for innovation and learning,” Bubel says. In addition to Bubel, the ACM executive board includes vice president Natalie Lane, secretary Zachary Senzer, treasurer Michael McClosky, and events coordinator Ryan McKenna. The Horn Program in Entrepreneurship is a University-wide enterprise with its administrative home in the Alfred Lerner College of Business and Economics. The Office of Economic Innovation and Partnerships works with the University community to turn research discoveries into meaningful inventions. SevOne, launched in 2005 by University of Delaware graduates Tanya and Vess Bakalov, provides network managers with monitoring, troubleshooting, and performance reporting capabilities.